The brief address event prompted political and diplomatic squabbling, but also was hailed as a landmark step for LGBTI rights in the country. Screenshot of a video of Lilit Martirosyan, a transgender activist, addressing Armenia's parliament on April 5. It must have taken a lot of courage for Lilit Martirosyan to walk into the parliamentary hall, stand up before lawmakers, and make history. 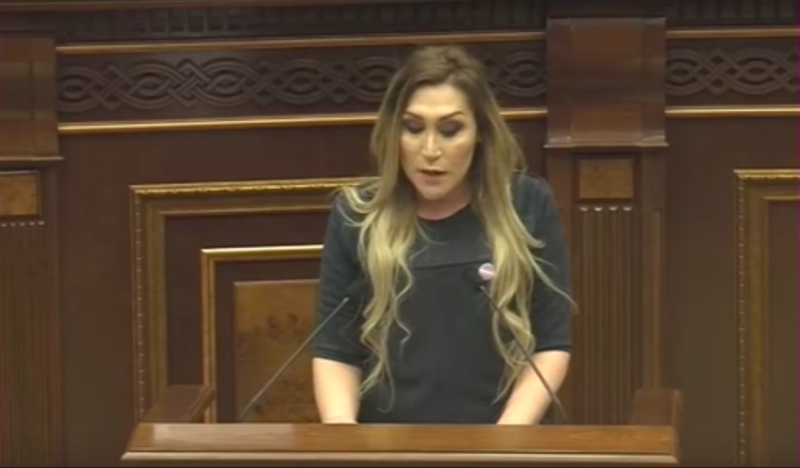 A transgender Armenian woman giving a speech in the country’s parliament was an unprecedented event in this socially conservative part of the world. “I stand for tortured, raped, burnt, stabbed, killed, banished, discriminated, poor and unemployed transgender people of Armenia,” Martirosyan, an activist for transgender rights, told the lawmakers at an April 5 hearing on human rights. She went on to say that hate crimes against transgender people mostly go unpunished. “I call upon you to carry out reforms and policies to achieve gender equality, and to ensure human rights for everyone,” she said. Predictably, the address angered some of the lawmakers. Three days later, a crowd gathered in front of the parliament, with a collection of religious figures and other social conservatives condemning the speech and, according to activists, threatening violence against sexual minorities. Some of the protesters even called for consecrating the parliamentary floor to cleanse it after Martirosyan’s speech. Some clerics concluded that the episode spoke to the fact that Armenia was becoming increasingly gay. “The number of homosexuals has increased in Armenia in recent years – a consequence of aggressive propaganda and spreading of European values – and this is a matter of concern for us,” Yesay Artenyan, a priest and spokesman for Armenian Apostolic Church, told Russia’s Sputnik news network.